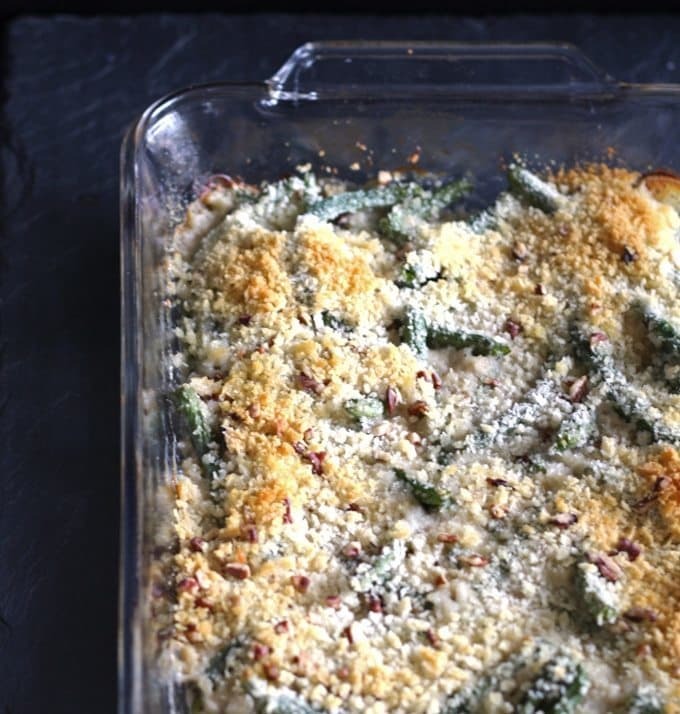 Gorgonzola green bean casserole is a perfect Thanksgiving side dish – add pecans and panko bread crumbs for extra crunch! Sometimes when I’m planning what I’m going to cook for the week, I get stuck on one ingredient. It could be because I have a taste for something. It could be because Mr. B. buys me 10 pounds of mushrooms… hello 3 mushroom recipes in a row. This week, all I can think about is gorgonzola cheese. If you don’t like blue cheese, then I recommend moving on. Here is my recipe index – look past the rigatoni gorgonzola and the pasta with pumpkin sauce (topped with a healthy dose of crumbled gorgonzola.) There are many non-blue cheese recipes on there. If you do like blue cheese, then you are in luck. I have reinvented a popular Thanksgiving side dish: the green bean casserole. My rendition takes away the crumbled onion topping and replaces it with panko breadcrumbs and pecans. The canned soup is replaced with a creamy gorgonzola sauce and it all is combined with fresh green beans. I am in love. With this dish. I have found myself running out to the grocery store over and over again to buy fresh green beans so I can make this again. And again. And again. I find myself wanting to eat this more than I want to eat macaroni and cheese which I know is weird but I’m okay with that. I hope you are too. On a side note, is it always tough to find fresh green beans? The local store that we usually buy our groceries at has been completely out of them more than once. I’ve taken to going to the large, chain stores instead. While it is totally worth the extra trip, I will be making this soon with canned green beans. I think the flavor would be a little off but we will see. 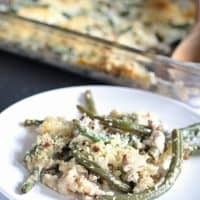 Gorgonzola green bean casserole is a perfect Thanksgiving side dish - add pecans and panko bread crumbs for extra crunch! Preheat oven to 350 degrees and grease an 8x11 inch casserole dish. In a small bowl, combine the panko breadcrumbs, pecans, salt and pepper. Set aside. In a large saucepan, place your green beans and enough water to cover. Heat over medium-high heat for 8 minutes. Drain the green beans and rinse with cold water. Set aside. In the same saucepan, melt the butter over medium heat. When the butter is melted, add the milk and stir until the milk is almost to boiling. Add the shallots and garlic and stir. Then add the gorgonzola cheese. Stir constantly until all of the cheese is melted (5 minutes or so.) When the cheese is melted, stir in the pecans, salt and pepper. 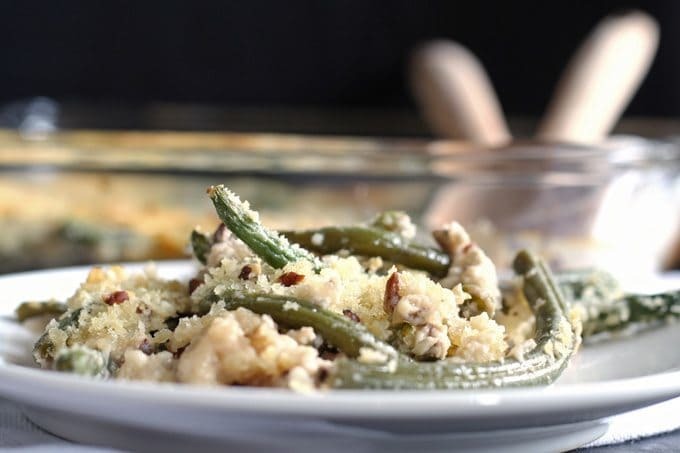 Put the green beans in the casserole dish and pour the gorgonzola sauce over the top of the beans. Pour the topping mixture over the green beans. Put in the oven and cook for 30 minutes. Serve hot. 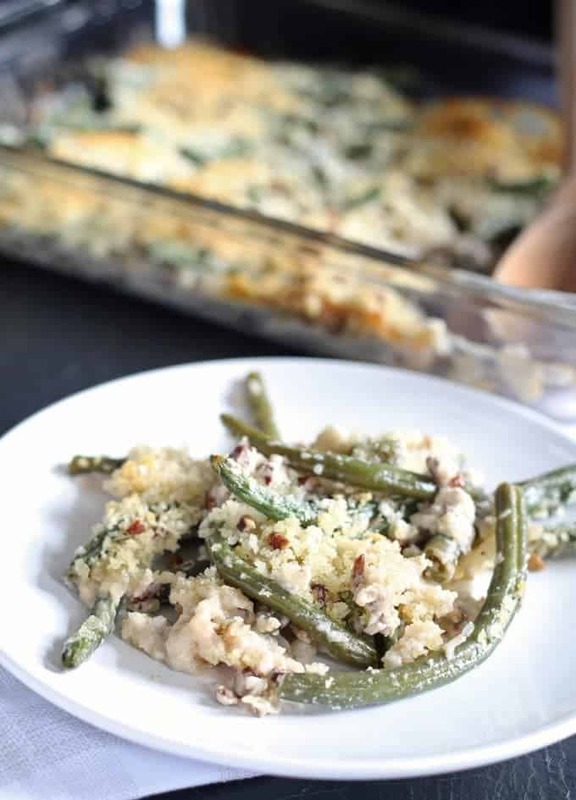 If you are looking for more green bean casserole recipes this Thanksgiving, check out my 8 Great Green Bean Casseroles round-up here. And keep an eye out – I have more holiday recipes coming up soon! it is not that i dont like them, i just dont adore them so i dont buy them many often! I’ve never heard of gorgonzola cheese. 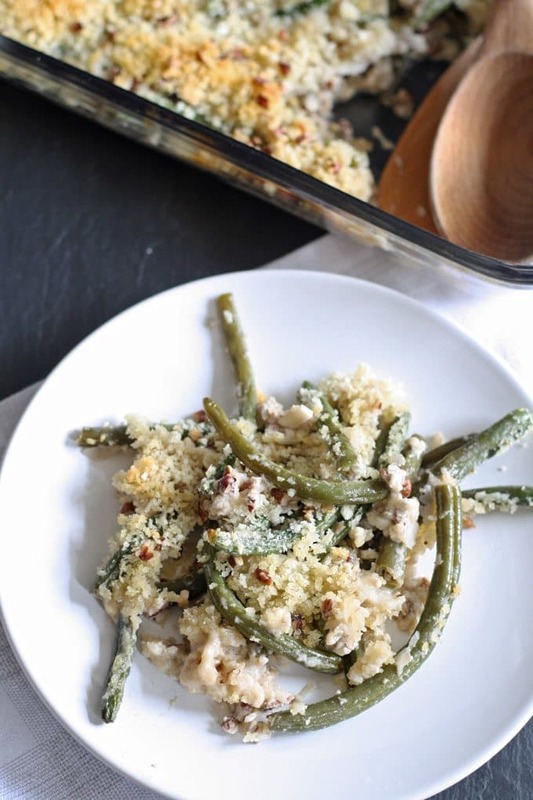 Interesting recipe for green bean lovers like me. Thanks for sharing. Gorgonzola is a type of blue cheese – if you can’t find it, try substituting any blue. I’m not a big fan of the traditional green bean casserole but this one looks and sound delicious. I’m going to give it a try. Great Kamla! I’m not a fan of the traditional one either – that’s why I came up with this one. Enjoy! This looks so yummy and is so unique, pinning! I love gorgonzola. But I am the only one in my family. 🙁 However, we are going to my brother in law’s for Thanksgiving…I know some of the other relatives that are going to be there like gorgonzola…this might be my chance! Or a girls lunch. Oh I am so wanting to make this…it looks wonderful! Pinning! Thank you for sharing it with us at Foodie Fridays! It’s too bad we don’t live near each other – I would make it for both of us! You made the news! As the “Queen of Holidays,” I have written thousands of holiday articles over the years. I wanted to let you know I included this recipe in the National Green Bean Casserole Day article! Feel free to share with your hungry fans, followers and friends! Every day of the year really is a holiday! I love green bean casserole, and this sounds extra delicious!